Interests - Frozen (film), Matilda the musical (songs especially), X Factor, One Direction, Olly Murs, singing, dancing, Disney Princesses, animals, drawing, art and crafts, Lego. She also loves Despicable Me, Monsters Inc, Madagascar, all Disney/Pixar films really. She loves threading beads and making necklaces. Ella was diagnosed with Congenital Nephrotic Syndrome at 8 weeks old. This is a rare genetic condition resulting in kidney failure, which meant Ella had to have both her kidneys removed and needing dialysis for 11 hours every night. Ella has spent an awful amount of time in hospital, and due to also having a low immune system, has spent many nights in ICU, HDU, and the renal ward. She has not been away from hospital for longer than 3 weeks this year, so the hospital has defiantly become her second home. Ella’s low immune system has also meant that she hasn’t been able to mix with other children as much as she would love to. Although Ella is a really happy sociable little girl, this year has defiantly taken its toll on her. She sometimes has little energy and can get frustrated as her body won’t do as she wants it to. She is small for her age and doesn’t look like a 3 year old and although she can’t walk she gets about bum shuffling when not connected to a machine which brings a smile to the people she passes on the ward. Ella has loved receiving post, on way home from school she will always ask “has the postman been”. She will always have issues, delays and transplant is not a cure but she is doing well (dare I say it, I’m touching wood). There are so many children in hospital, I know how much it helps receiving post when inpatient and decorating the room with cards and pictures definitely helped brighten the grey walls. Thank you so much for the past 6 years on Post Pals, it’s brought many many smiles over the years even when smiling was the last thing we wanted or were able to do. Ella’s knees and back are continuing to cause her pain if she’s on her feet for too long and she has stopped trying to take steps. She took her first ever steps earlier this summer but because of her problems with her bones her legs and joints are not aligned straight and they hurt which is putting her off. Ella is still having water infections that she can’t seem to shift, but this is probably down to her low immune system and anti-rejection medicines she has to take. Ella has been having pain in her back legs and knees, so she’s got some new special shoes and insoles to help support her feet and ankles. We hope this will help, but her feet, ankles, legs, knees and hips, are not in the correct positions, so it will always be an ongoing problem. She’s also having to go back on epo injection again, as her heamoglobin (although better than it once was) is not where it should be. Add that to the fact she already has 4-6 injections a day for her diabetes and she’s feeling like a pin cushion, but once they’re done she’s fine. Her hearing also seems to be getting worse, which is another side effect of the steroids, so it’s going to be checked. After all her hair falling out, it has started to grow back. Although there’s no legnth yet, it is starting to get thicker, so she’s hoping it continues. Ella always has the horrible side effects to any meds that she has, even if small risk, and for a girl it is an especially big thing to lose your hair. She just wants princess hair and a plait like Elsa from Frozen. Despite all this, Ella had a fab time at the transplant games in Newcastle where she won a medal and 2 in team trophies. On one race, right at end, she left her walker and walked over the finish line – she was so happy and I was a very proud and emotional mummy! Ella has been well in herself although she has needed lots of trips to hospital for blood tests. This is because we’ve been struggling to shift a urine infection, so lots of new antibiotics too. 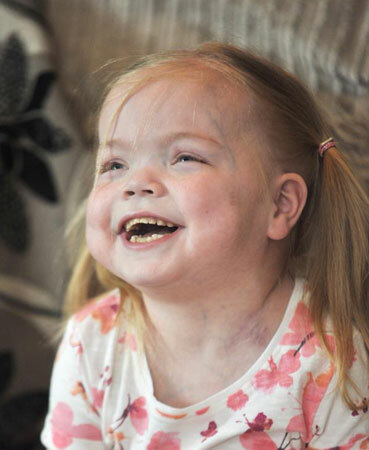 On a happier note Ella took her very first steps, at nearly 8 years old, which got her on the tv 3 times – twice with Granada reports and once on Good Morning Britain. She now tells everybody she is famous – she really loved being on tv and lapped up all the attention. Despite the first steps being taken, this is causing problems with her legs, knees and back as they’re in funny positions. This is due to bone disease dialysis and not walking. When she does walk, this is putting pressure on her joints and back, but we’re hoping some more supportive shoes and physio will help this. Ella also needs to restart epo injections to help increase red blood cells, as hers are low so she’s a bit anaemic. It’s not good as it’s another injection and she already has insulin injections about 5-7 times a day. On 7th May it will be 1 year since Ella’s kidney transplant. It is a huge milestone for Ella and the family, so we’re having a little party for ‘sidney kidney’, as this is what Ella calls her kidney! Two days later on 9th May, Ella has been chosen to be race starter for the Morrisons Great Manchester mini/junior marathon. She’s so excited and has insisted she wants to do it with her walking frame not wheelchair. Ella had a fab Easter – her first Easter that she could eat Easter eggs, as she couldn’t eat them before transplant due to strict renal diet. She was also in ICU at Great Ormand Street hospital last summer. We are having issues with Ella’s anti rejection meds as her hair is falling out and there’s not much left now. If things don’t improve we may have to change meds, but a happy kidney is more important and so it will needs lots of thought. Diabetes is also still an issue, requiring lots of insulin injections every day, so it wasn’t short term as we had hoped. Ella’s had extra trips for blood tests at hospital this month due a to water infection, but luckily antibiotics sorted that out again. Ella has had 2 hospital stays this month, both with very high temperatures. The first time was put down to viral infection and infection around her gastrostomy button site and the second time she had a water infection. Luckily once the antibiotics kicked in Ella was loads better and blood levels improved. We have to go back again on Monday for repeat bloods as her blood clotting level has gone too high again, so we need to adjust her warfarin medicine dose. Consequently she has been at the hospital a lot these past few months but luckily Ella likes it there. Apart from the typical cough and cold, Ella has been well lately – it just takes her longer to fight bugs and illnesses as she is immune suppressed. Transplant clinic appointments are now every 3 weeks instead of every 2 weeks. She’s going to school full time and doing well. At the moment she’s enjoying practising her school nativity play. She is opening the play and she’s in her element when on a stage, so she’s very excited. Ella has been going to hospital each fortnight for transplant clinic. The doctors are happy although there’s still an issue with her heamoglobin level being low (which is ongoing) and her pottassium being high, but they assured me it can take a while to settle. Ella’s anti rejection meds are also making her hair fall out so we are also keeping an eye on that as it has gone very thin. The good news is her growth is picking up, as at the beginning of the month growth hormone injections were being mentioned because she’s so low down on the height charts. However, over the past 3 clinics Ella has grown 2cm each time, so she’s definitely having a growth spurt and at clinic yesterday the doctor said we can hold off on the growth hormone injections. Ella still has diabeties which I was hoping would have settled by now, but as she is still on steroids her sugars are going to be high, so she’s requiring regular insulin injections many times a day. August has been a busy month with lots of clinic appointments to change Ella’s medication. She was having injections twice a day to thin her blood, but on top of all the insulin injections and finger pricks to test blood sugar, this wasn’t ideal. The medicine in this injection also really stings, so we were swapping for warfarin in a tablet form which is kinder than injections. However, this meant going every day to hospital for bloods until she reached the correct blood clotting level. Whilst this was going on, Ella’s haemoglobin level dropped again so she needed a blood transfusion. This is not ideal for transplant patients so to prevent needing another Ella also had an iron infusion a week later. The week before bank holiday Ella’s cmv infection returned, and although well in herself, this caused her creatine (kidney function) level to creep up which isn’t a good sign. She spent the week going back for bloods but each day it got higher, so Ella got admitted over bank holiday weekend and had operation number 41, which was for kidney biopsy and to start iv steroid infusions. We had a long 24 hour wait for results but luckily they came back ok and her levels had come back down. Luckily they could also stop steroid infusions as this caused Ella’s sugar levels to go through the roof and not even recording on the tester. On a good note, Ella has been well and her legs are definitely getting stronger. She is using her walking frame for longer periods and getting more confidence using it. Ella is doing really well (dare i say it!) and we’re nearly 3 months post transplant. Clinic appointments are now every 2 weeks instead of weekly. This is very strange for us as we’ve gone from going every other day, to weekly, and now fortnightly. It is a very nice strange though. Ella had her 40th operation a few weeks ago to have her stent removed and her gastrostomy tube changed to a button as she needs this for all her medicines. Ella is still having to have blood sugars checked and is needing insulin, but she’s still on steroids and we’re not sure when these can be stopped. She obviously doesn’t like all the finger pricks and injections every day, but luckily will forget after a while. She is also still having blood thinning injections but the doctor did say we could possible swap for aspirin which would just be tablet so one less injection. Fingers crossed! Ella had her kidney transplant on the 7th May and is doing well. She is still in hospital though as the steroids needed have affected her pancreas and she now has diabetes. We are hoping this will be a temporary thing but in the meantime she’s needing lots of insulin injections and lots of finger pricks to check her blood sugar levels which aren’t nice. However she soon forgets about them and is happy and playing again. Ella got transferred to Manchester children’s hospital from GOSH last night (4th June) so we’re nearer to home now. We’ve been far away from family and friends for a long time. Ella is on her way back to Manchester children’s hospital from Great Ormond Street after a good response to her kidney transplant. Thank you for everybody’s messages, it has been such a hard 24 hours. The operation went really well (although it took 9 hours) but the surgeons were really pleased. She got taken back to theatre to open her up and look at the kidney as she wasn’t urinating, but thankfully after an hour the surgeons told us the kidney looks fine. They think it is just a sleepy kidney which is common, especially as the operation was so long. She’s now doing 7mls per hour which we’re so happy to see as Ella hasn’t urinated since she had both her kidneys removed at 19 months old. Fingers crossed it starts to pick up more but after 2 operations in one day I’m not sure my nerves can take any more! It is never straight forward for my poor baby girl. Once again, plans were made to come back to Great Ormand Street on certain a date in preparation for transplant which is planned for 7th May. The day after getting this plan Ella’s dialysis line wasn’t working properly and then the next morning Ella had pulled it again. After a big panic and flap we got her to Manchester Children’s Hospital where we were blue lighted in an ambulance to Great Ormand Street. This was the day before Good Friday. Once at Great Ormand Street we spent the night trying to get Ella’s potassium/phosphate levels down. Due to not getting dialysis since the Monday these were high, as her body can’t break these down and are harmful and dangerous if too high. She was on 2 lots of different i.v meds and nebulisers hourly through the night to make her safe to go theatre. This took a while and she didn’t get to theatre until 12 midday. We were told this was a very tricky operation with no guarantees of getting a line in due to Ella having really bad access because she’s had so many lines previously. There was talk of maybe going into the liver but this was also very tricky. Luckily the surgeon got a new line in just above where her old one was. Ella had to go straight to intensive care on a ventilator after the operation as she was so fluid overloaded they struggled to get the breathing tube down her. They were worried if they took the tube out there would be problems, so she went to icu on continuos dialysis until all the extra fluid was taken off her. Two days later Ellaa was extubated (taken off ventilator and breathing tube taken out). On Easter Sunday Ella was transferred back to Eagle ward and allowed a little bit of easter egg. We’re still there now as it was felt best to stay here until transplant, so she’s had her ECHO ultrasound, chest x-rays and blood tests, all in preparation for transplant on 7th May. Throughout all this Ella has been oblivious as likes being in hospital and we’ve had chances to get out for walks and to the park. Ella is now off the ventilator and has moved back on to the ward from ICU. Ella is at Great Ormand Street hospital in PICU on a ventilator. She pulled her dialysis line out and as she didn’t get dialysis since Monday, all the extra fluid that built up made her extremely fluid overloaded. So she had operation 36 to put a new line in, which luckily they managed, as it is extremely difficult to find access. She went straight to picu and hopefully once all fluid is off they can take her off the vent. After the past 2 transplant cancellations in February and March, Ella is now home and continuing her heamo dialysis at Manchester children’s hospital 3 times a week. We have been given a new “provisional” date for transplant as May the 7th. We would be going back to GOSH two weeks before (around 23rd April) so fingers and toes crossed and prayers it goes ahead this time. Ella has had a very rough time after being admitted to hospital on 15th January with a line infection. She had to stay in for 6 weeks of iv antibiotics and whilst there we got a date for transplant, which was 19th February. So, at the beginning of February we were transferred to Great Ormand Street Hospital from Manchester Children’s Hospital. Unfortunately, the day before transplant, whilst having dialysis, Ella had a seizure and the transplant was cancelled. She had an emergency CT scan and luckily this was ok and the seizure was due to the more intense dialysis washing out her medicines. We were soon given a new date for transplant (18th March) and allowed to go home to return to GOSH on 11th March in preparation for transplant. A couple of days before leaving for GOSH we got a phone call saying transplant had been cancelled as there was a problem with theatre slots. We were assured this was all sorted so it left us all very angry and confused. Luckily, a few days later, we managed to get everything back on track and we went to GOSH the following day. Whilst this was going on Ella had been complaining her leg was hurting and swollen and she wasn’t wanting to move it, so we got her leg scanned whilst at GOSH. This showed the muscle in her thigh was full of blood so she needed a trip to theatre which got cancelled at 10pm after being nil by mouth all day. Luckily, Ella went to theatre at 3pm the following day for operation number 36, to have her leg drained and leave a drain in.the operation went well and Ella was ok despite needing 100mls of blood draining just from muscle. The drain was removed the day before transplant, but after an echo scan on the same day, the consultants decided it was best to cancel the transplant again. So, in the space of a month we’ve had the transplant cancelled twice on the day before. We are now at home but don’t have a new date yet. We’re waiting to hear back from GOSH as to what the next plan or date is. Ella is still in pain with her leg but nothing like it was, so we are hoping it’s just a case of needing time for it to heal, as she was left very badly bruised. Ella is being transferred back to Manchester Children’s Hospital today. We should have been going home today but because of her high blood pressure we’ve got to stay in hospital. She will be back to GOSH on 11th March ready to try transplant again on the 18th March. Ella’s transplant didn’t go ahead yesterday after all the build up and planning and 6 weeks already spent in hospital. She had a seizure during dialysis on Tuesday afternoon (the day before transplant) so it had to be cancelled. Luckily, despite needing to be sedated and an emergency ct scan, there were no bleeds and they think it was all down to needing a higher dose of meds now that she is on anti rejection meds, as one of them lowers the seizure threshold. So it is a case of waiting for blood results for levels and also waiting for another date. More importantly though, Ella is fine in herself. Ella is now at GOSH as we got transferred from Manchester children’s hospital today. I was hoping to get a couple of days at home next week before transplant as we’ve already been in hospital 3 weeks but we’ve been told we’ve got to stay in, so it’s looking like a very long stay ahead and far from home. Ella has been in Manchester Children’s Hospital for the past 2 weeks. She had a line infection so is being kept in on 3 different iv antibiotics. Doctors have said they want her to continue the iv antibiotics for another 2 weeks, although this now may be longer as on Monday we got a phone call from GOSH with a date for transplant. The date is 19th February and so we may be on them up until transplant and are looking at a long stay in hospital. We got a phone call from GOSH yesterday. Ella’s transplant will be on 19th February. She’s still in Manchester Children’s Hospital on ivs and will be for 3 more weeks. We are hoping we can go home for couple of days before we need to go to GOSH, but it looks like it will be out of this one and straight to GOSH, so we are looking at a long stay in hospital. Ella has had a rough couple months and spent 5 weeks in hospital having 3 operations in the space of a week. This was due to problems with her central line which she’s dependant on for dialysis. Luckily the new central line was put in and an artery on the opposite side that had been blocked due to previous central line being there was unblocked and a stent put in to keep the artery open which was a relief. From this operation another clot was found which wasn’t there the week before and we found out Ella had abnormal blood clotting, so we had to stay in hospital on continuous heparin infusion to thin her blood and had to have bloods taken every 4 hours which was very stressful for her. She is now having this treatment by having an injection twice a day which she hates and gets so upset, but luckily after lots of cuddles she calms down. As for the transplant, we were originally told it would happen before Christmas but that’s obviously not the case now, as we’re still waiting to hear back from GOSH. Despite all this Ella is very excited for Christmas and is loving all the Christmas songs and decorations. Back home from an emergency admission / transfer from Manchester Children’s Hospital to Great Ormand Street Hospital. Ella’s line started playing up last Saturday as when connected to dialysis machine the flows needed to filter and clean her blood were not strong enough. After unblocking infusions it was a trip to theatre for a new line. This was operation 33 but unfortunately she came back from theatre with no line and the surgeon saying there is no way of dialysing Ella. Luckily, within hours we were on our way to Great Ormand Street and the next morning had operation 34. After a very long 4 hours a line was put in. It was a horrendous week but despite this Ella remained her cheerful self and just wanted to go in the playroom. We’re now waiting on a date to go back to GOSH for more detailed scans either next week or the week after. Ella was transferred to GOSH from Manchester children’s. Her operation on Monday night did not go to plan as the surgeon could not get a central line in which she is dependant on for dialysis. After a CT scan at Manchester, GOSH said they will try using balloons and stents, so Ella is in theatre now at GOSH having this done. We’re still waiting to hear about next stage of transplant work up and still awaiting a date for this. Ella has had a good month settling into her year 1 at school and likes her new teacher. Ella had an echo scan at the hospital as build up for transplant. Luckily everything was fine so now we’re just waiting to hear back from GOSH. A huge thank you to everybody who sent birthday cards for Ella. After looking at each card she shouted ‘thank you Post Pals!’. Huge thanks for the moshi monsters magazines too, I thought Ella was going to burst with excitement! Tests are still ongoing with Ella’s Nanna who’s a blood and tissue match to donate her kidney to Ella but now is having scans and blood tests to see if her kidneys are working fine. Next month will be 3 years since Ella’s transplant happened and failed within the same day and it was scary times as it is Ella’s only option, so it is very good news that Ella can have a second transplant as last year wasn’t an option due to poor arteries. Apart from this Ella is enjoying the school holidays and continues to go hospital three times a week for her dialysis. After having a new central line put in (after only having the last one put in on the 15th March) things have been ok. We are currently awaiting blood results from Ella’s Nanna to see if she is a match to donate her kidney. This will be Ella’s second transplant and due to the first one not working this transplant is being treated as high risk and being done at Great Ormand Street Hospital not Manchester. This means we will be a long way from home but it is Ella’s only option. Ella continues to go hospital 3 times a week for her dialysis and enjoys using all her new colouring books and kits to occupy her whilst she’s connected to the dialysis machine. After returning from Great Ormand Street where Ella had a new dialysis line fitted, this has since had to be removed and a new one put in. This was tricky as her access is poor, but luckily a new one is in and working. In the past week we have heard back from Great Ormand Street, who after looking at results, have said there is a vein/ artery big enough for Ella to have a kidney transplant. This came with very mixed emotions as Ella’s first kidney transplant went very wrong. Last year we were told she was untransplantable though, so obviously this is good news now as transplant is the only option for Ella. We have no date or time span as to when this will happen, just that they will push for it to happen. A family member is awaiting an appointment to have further tests done to see if she can donate her kidney. In herself, Ella is doing well, enjoying school and getting excited for an upcoming holiday. It has been quite a stressful month. Ella’s planned operation to create a fistula in her arm didn’t go ahead as the morning of the operation an echo scan showed a clot inside her main artery where her dialysis line lies. So another operation was arranged to remove the line as this would break the clot up or it would come out with the line and they would put a new line in. The operation seemed to go well and Ella was sat up wanting toast within half an hour of being back on the ward, but another echo scan showed the clot is still there and is in the same place and same size, so it felt like a waste of time. However, the operation provided an opportunity to put dye into Ella’s veins and arteries so the consultants can look at them and see if Ella can have a transplant again. We’re still waiting to hear back from GOSH so I’m not sure on the plan yet. We are still awaiting the results of Ella’s scan she had done on her arms. It was to look at her main arteries and veins in her arms to see which would be best to create a fistula in her arm, as this is seen as a better way for Ella to receive her heamo dialysis in the long term because there is less chance of infection and it lasts longer than hickman lines do. We went down to Great Ormand Street for this and were then sent to Guys hospital for the scan. So up until we hear back from GOSH we won’t know what type of fistula Ella will be having and when. It is difficult trying to get information as Manchester children’s hospital have never put or used fistulas in children (just teenagers) so we just have to wait for GOSH to get in touch with Manchester and then let me know. Ella had a short stay in hospital in January due to high blood pressure which led to her becoming unwell, but luckily was fine soon after. Ella’s mri scan was cancelled last minute as her consultant decided it would be best for her to have a general anesthetic rather than just sedation, so that will be happening on the 7th January. Hopefully we’ll then get an appointment at GOSH to see a consultant as nobody at Manchester has created a fistula in a child as young as Ella (just teenagers) but luckily they have at GOSH. So, once we’ve had her appointment we will hopefully get a date for operation number 30. Ella needs a fistula creating in her arm for her heamo dialysis, she has always had rubbish IV access and has had lots of central lines which she uses at the moment, but central lines don’t last long so fistula is the best option for Ella. Ella is very excited for Christmas and is looking forward to her school nativity play and Christmas party at school. Ella is continuing her heamo dialysis 3 times a week at the hospital and going to school on the days we’re not at the hospital. She is doing really well at school and has settled in well in her first year at school. After spending most of summer in hospital, we made it through October without admission. Next month Ella is having an mri scan to see veins in her arms. This is so they can put a fistula in her arm so that we are not dependent on just the hickman line for her dialysis. We have to go to Great Ormand Street Hospital which we have never been to before, as no surgeon at Manchester children’s hospital or nearer to here has done this operation on children, only on teenagers, so it is all new for them as well as us. Luckily GOSH have done this on young children. After had scan at Manchester, we will hopefully get a date soon to go down to GOSH and talk about having the operation to create fistula in her arm. This will be Ella’s 30th operation but it probably won’t be until January. Ella has had a rough couple of months as she spent most of summer in hospital. In May, we had to take her to A&E with the same reoccurring problem of severe tummy pain and vomiting. After being given way too much morphine and it not even helping, Ella had operation 27 to repair a huge hernia and to remove a small part of bowel and insert a support for her tummy wall where it had broken away. She also needed a new hickman line putting in as this operation meant she would have to temporarily switch to heamo dialysis instead of the dialysis she has at home (peritoneal dialysis) as any fluid going in would put too much pressure on the large scar after surgery. Ella had a long recovery as she had high blood pressure and she’s had that much surgery on her tummy that things took a while to start again and then her scar started to open a little bit which needed vac therapy treatment. By the middle of July she finally came home although she’s still having to come to hospital every Tuesday, Thursday and Sunday for heamo dialysis. Unfortunately, with being in hospital, Ella missed all the settling in days for her new school and we also had to cancel a family holiday. By August, the nurses tried her back on peritoneal dialysis, but the catheter for this was blocked so operation 28 went ahead in the hope of getting a new one in time for starting school. The operation seemed to go well as the surgeon managed to get a catheter in and although Ella was well and in good spirits when she first got back to the ward, I noticed after a few hours that she was breathing fast and had a high temperature and was then complaining of tummy pain. Three types of I.V. antibiotics were started but as days went on there was no improvement, so 4 days later Ella went back to theatre for operation 29 and unfortunately the surgeon had to remove the PD catheter and said her peritonaeum had adhesions that weren’t there 4 days prior, and although fluid went in, non came out, so home dialysis was no longer going to be an option. The next day Ella started vomiting badly and needed an NG tube putting in to free drain all the bile in her tummy and was put nil by mouth. Luckily (and finally) by September and the weekend before her birthday, Ella started eating and drinking and moving about and being back to herself and was finally discharged from hospital. Although Ella missed her first day and first week of school, she has started her ‘settlings in’ this week. She did an hour on Monday morning and did 2 and a half hours Wednesday and really enjoyed herself. It will be a long process settling her in and she still needs to go hospital for dialysis, but she can at least go to school on Mondays, Wednesdays and Fridays. Ella also had a fab 5th birthday on the 9th September and enjoyed a party with friends and family. Thank you for all her cards and gifts! Ella has had a very tough 2 weeks and is still poorly in hospital. She had her 27th operation last week and needed part of her bowel removed – luckily only small part, but it was still not expected and she had to go straight to HDU. Ella also had a bad reaction to the morphine and had to be kept on oxygen and was also requiring blood sugars and gases done every hour so she was being pricked every hour. Due to the operation they had to change her form of dialysis – she was on peritoneal dialysis but has had to change to heamo dialysis to give her tummy a break. We are hoping she can go back onto pd dialysis before she starts school in September. Ella’s also had to be put on feeds as after 2 weeks she is still not eating or keeping fluids down. On the plus side, Ella is now off oxygen, morphine and ketamine, so I’m hoping things start settling down and improving very soon. Ella had another stay in hospital with her re-occurring abdominal problem of extreme sickness and pain brought on by constipation, which resolved itself by day 4 . Doctors are thinking her intestines may be getting affected by her dialysis and numerous surgeries on her tummy, so not much can be done at this point apart from manage it as it occurs with i.v. pain relief and fluids, lactolose and suppositories. Unfortunately this admission happened on Easter Sunday so Ella not only missed out on celebrating that but she also missed out on going to see cbeebies live as we had tickets for her for that day. On a better note, Ella is loving her new house and has more space to practice getting her legs stronger by being helped to walk about whilst we hold her hands. Her latest x-rays have shown her ankles are in a better position than they were 6 months ago too. They’re still not in the right position but are much straighter than they were so we’re hoping this continues now her parathyroid level has improved and she has the strength to try and get up on her feet. She also got a walking frame today which were excited about. la is back in hospital again with the same symptoms as the last few admissions – very bad tummy pain and sickness. I’m hoping iv pain relief works better but we need to find one that works better because they said they can’t give morphine as it will make things worse (can apparently make you constipated). The operation Ella was due to have in October that got cancelled (due to her having a cough) is at present no longer required. She was to have her para thyroids removed as they were over active and causing all calcium to leak out of her bones. This was making her bones spongy and weak and so leaving her with bone disease and unable to walk. However, bloods taken since October have shown her pth levels drop from 2500 to 150 (this is still not a normal level as it should be below 50, but it is a huge improvement on what it was), and i am noticing the difference as Ella seems to have more strength in her legs and is always asking to be stood up. Although we still have to hold onto her, this is a massive improvement as she couldn’t do it before and would cry if we tried to get her to do it, so I’m hoping this continues. A huge thank you for what you do. This is an amazing charity! Mornings can be quite stressful in our house with medicines and dressing changes, so when the post gets delivered my daughter gets so excited and soon forgets the trauma of sticky dressings and yucky medicines. I have often had to say to Ella to have the medicines quickly and then the post man will be here! Ella’s operation went ok but unfortunately we can’t go home today as she now needs i.v. antibiotics because she had a high temperature, so we’re waiting on blood results. Ella is having another operation on Friday to have a pd catheter fitted so hopefully when tested in a couple of weeks time we can go back to having dialysis done at home rather than in hospital. There’s no guarantees as her peritoneum was damaged but fingers crossed it has now healed and we can do dialysis at home as Ella has spent way too much time in hospital! Ella has now been moved to the ward after spending a week on a ventilator in ICU. MRI and CT scans have shown little bleeds on the brain and sign of a stroke down to a condition called PRES (posterior reversible encephalopathy syndrome). We have to be patient as recovery will be a long slow process and we’re not sure by how much. Today was good day though, she’s moving arms and legs a bit more and her eyes are focusing/following a little better. She also blew a kiss to her favourite nurse and gave her daddy a high five. Please could everyone pray for my little girl Ella. She’s on a ventilator in ICU. MRI and CT scans have shown bleeds on brain. I just want her to get better so I can give her a huge hug. I’m missing my cuddles and need them more than ever. Ella had her kidney transplant in September, but sadly the transplant failed and Ella was only allowed home on the 2nd of December.